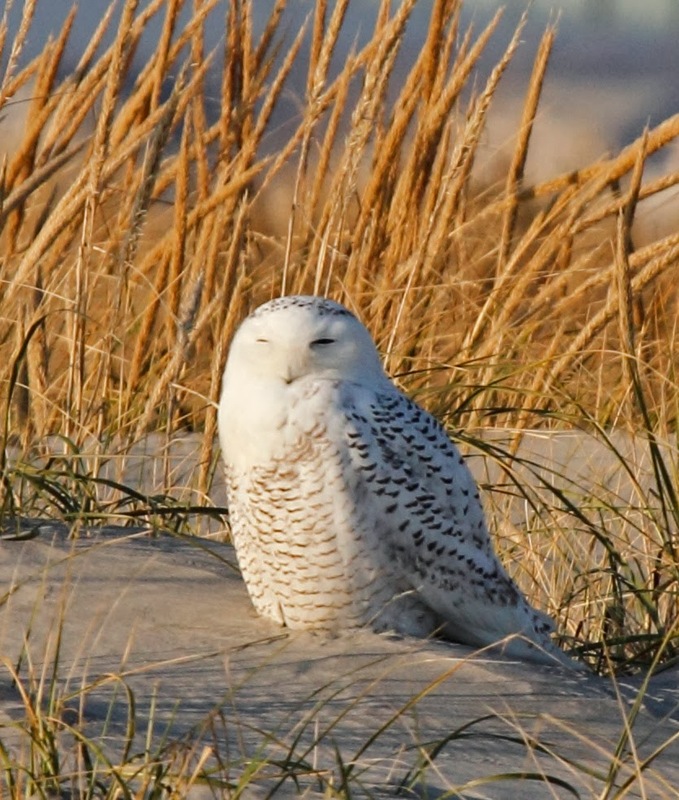 Snow Owls are literally everywhere this year. 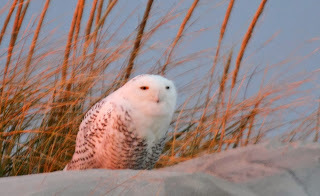 My last post told the story of the first 2 owls that were reported in NJ this year. 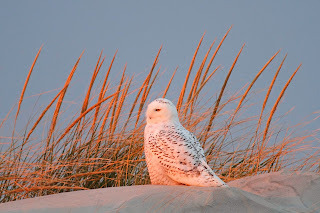 Since then, Snow Owls have been reported from all over the Delaware Valley including 2 at Stone Harbor Point which I photographed at length on Sunday (photos below), at least 4 in Delaware, 1 at the Northeast Philly Airport, another at the International Airport, a few in Amish country, another one near West Chester today, a few reports from my friend Frank in New England, and I even saw a photo of a Snow Owl sitting on a building in Bermuda. You read that right - Bermuda, the little island in the middle of the Atlantic ocean. NemesisBird bloggers put up a special webpage to track sightings called Snowy Owl Watch. 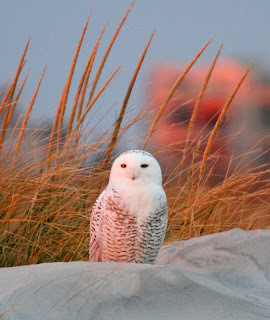 Here is the link: http://www.nemesisbird.com/news/snowy-owl-irruption-watch-2013-14/ . 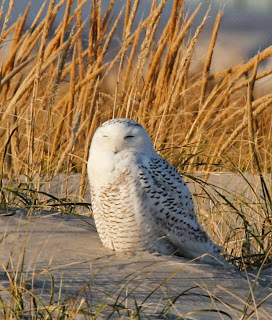 A few photos from my latest encounter with one of the most accommodating owls in history. This guy - yes it's a male - sat out on the beach while joggers, dog walkers, jeeps and birders passed by, stopped to gawk and photograph him and never moved . . . 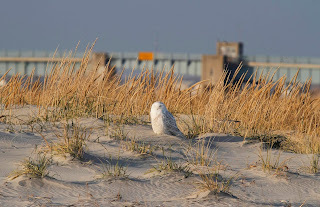 The first photo shows the "Free Bridge" that connects Stone Harbor and Wildwood in the background. Here is a closer view. You can tell this is a male due to the thin barring on the chest and light markings on the head. Here is a photo later in the day when the light started to get nice and pink. The owl just sat there until . 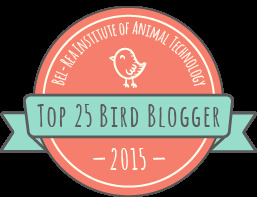 . . a Great Blue Heron flew overhead. Who would have thought that an owl would be afraid of a heron? I had the fortune of having a famous photographer show up and help me with settings etc but I still didn't get a crisp shot of Scaredy Owl when he hunched over and took cover in the reeds. Did you ever think they would be commonplace? Enjoy as many as you can, they may not come back.